I acquired the game on 20111223 as part of the Steam Winter Sale 2011: Awesome Indie Bundle. 20120705 9:21pm stay out of moms things! 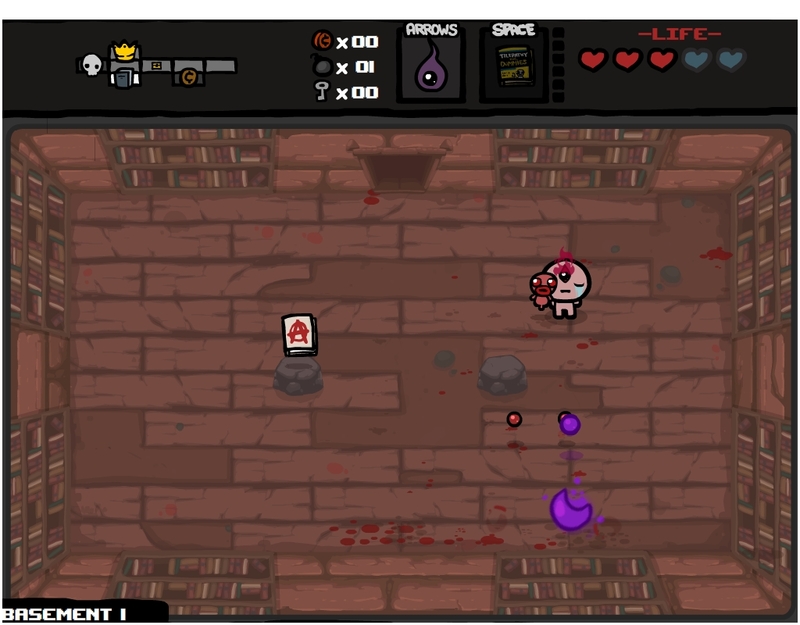 The library gives a random choice of two spacebar abilities. 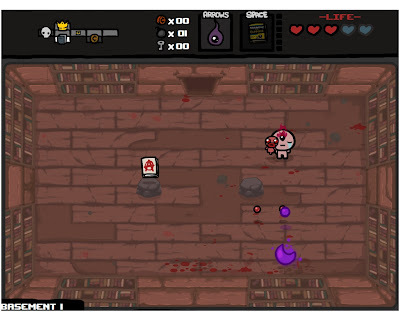 I got the Wrath of the Lamb DLC on 20120713 as part of the Steam Summer Sale 2012. 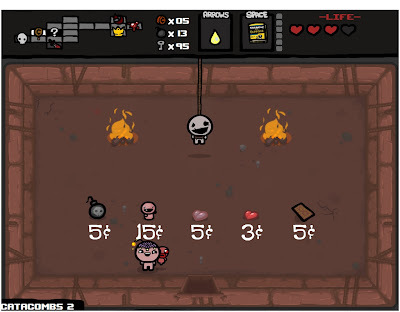 A copy of The Binding of Isaac + Wrath of the Lamb DLC is available in the Humble Indie Bundle 7 (December 2012). Today I decided to play the game some more, because my friend said the game experienced drops in frame rate and/or lag. I played between half an hour to an hour with detail set to high and I didn't experience any noticeable drops in frame rate and/or lag. I should ask my friend if his experience was any different with detail set to low. Shop with random items available for purchase. The other day I asked my friend and he said he was experiencing low frame rate on his computer with detail set to low and the lowest possible resolution. 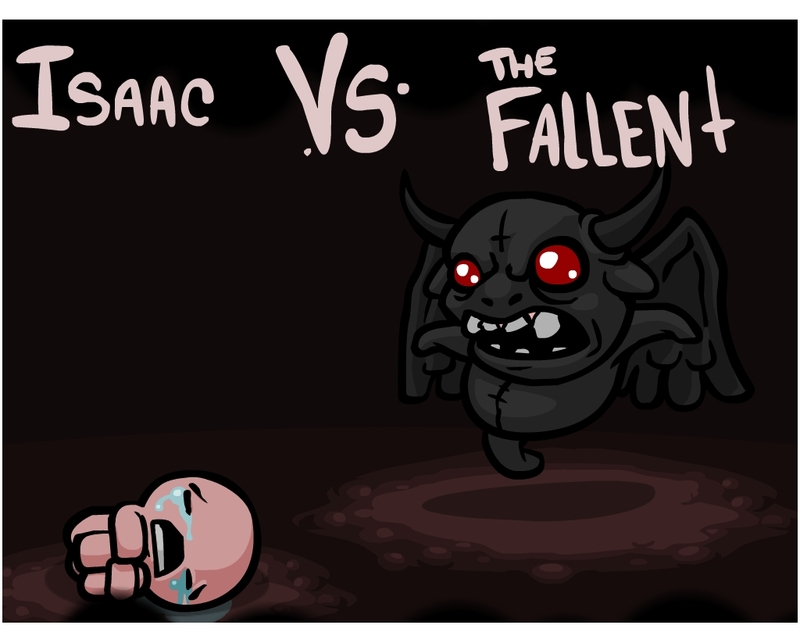 I guess he did complete the game (beat Mom), but it was easy to do, because everything was moving slower, and thus he was not satisfied with the experience. That's quite unfortunate. 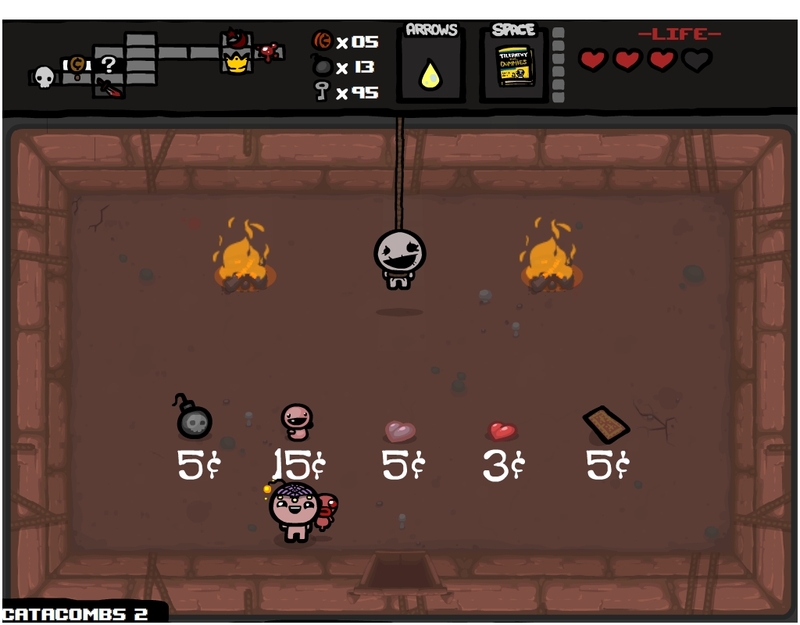 Tip: I realized recently that one should simply use the first many playthroughs experimenting with all the power-ups. Press spacebar with every spacebar power, press Q with every Q power. Pick everything up. The alternative, less fulfilling and/or time-saving experience is to search for a FAQ which fully describes everything in the game. 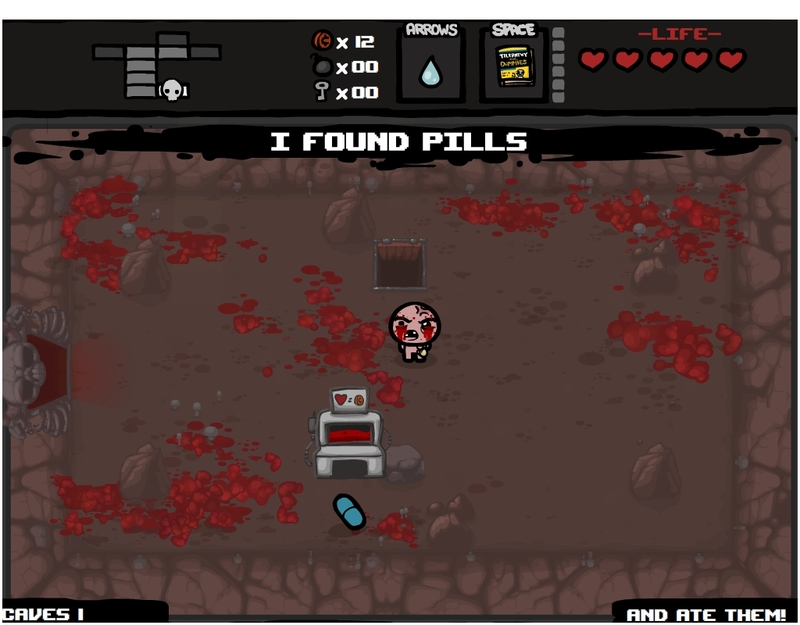 Oh wow, while playing today, I learned there's a reason to actually just try the pills. 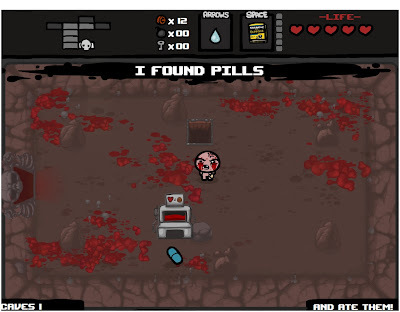 Because after you try them, the next time you come across that pill, it'll be labeled with what it does! 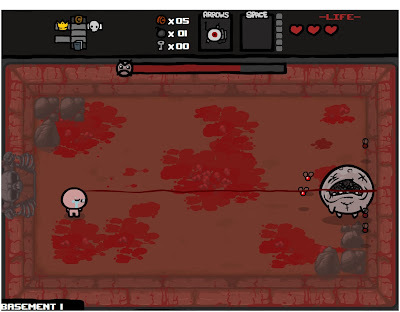 Overall, I find The Binding of Isaac fun and full of replay value. A key to playing the game is finding the balance between kiting and going head on, because sometimes dodging excessively will just get you killed slowly. Of what I've seen and heard, I love most of the game's artwork and I love all of the game's soundtrack. 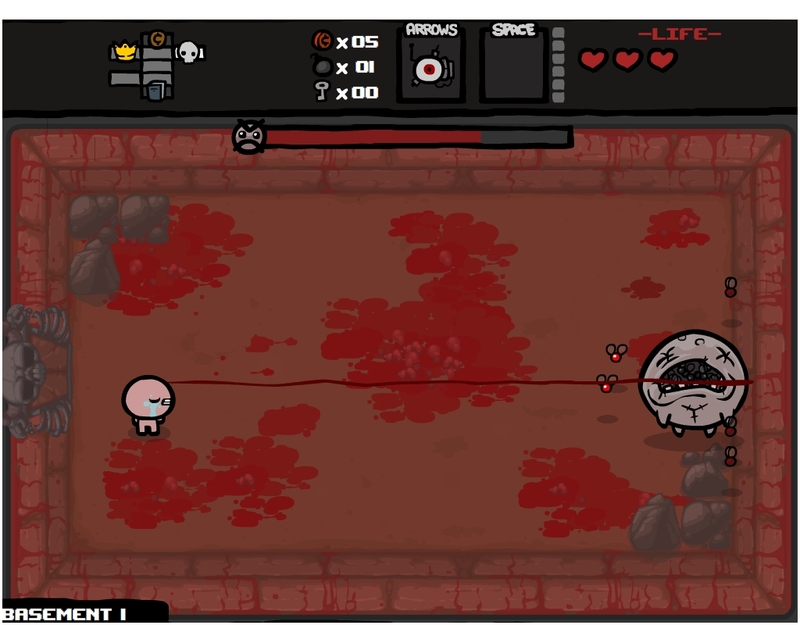 Isaac's appearance changes as he picks up power-ups.